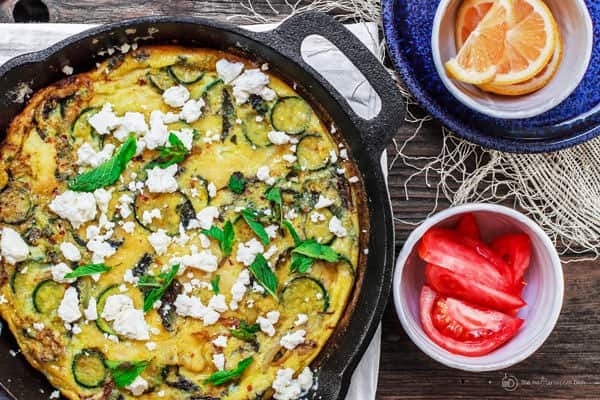 A baked omelet made Middle Eastern style with zucchini, onions and lots of fresh mint leaves. Comes together in 30 mins or less. 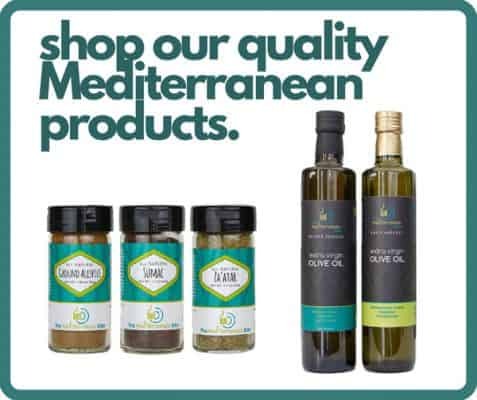 The perfect breakfast or brunch, especially with a side of fattoush or tabouli salad! Be sure to scroll down for the step-by-step tutorial with photos. If you are from Egypt, you’ll recognize this as eggah. In other parts of the Middle East, they call it Ej’jah with the emphasis on the “J.” And the Persians call it something altogether different, kookoo. All these names refer to the same thing: baked egg pie or baked omelet. Basically, the Middle Eastern version of frittata. 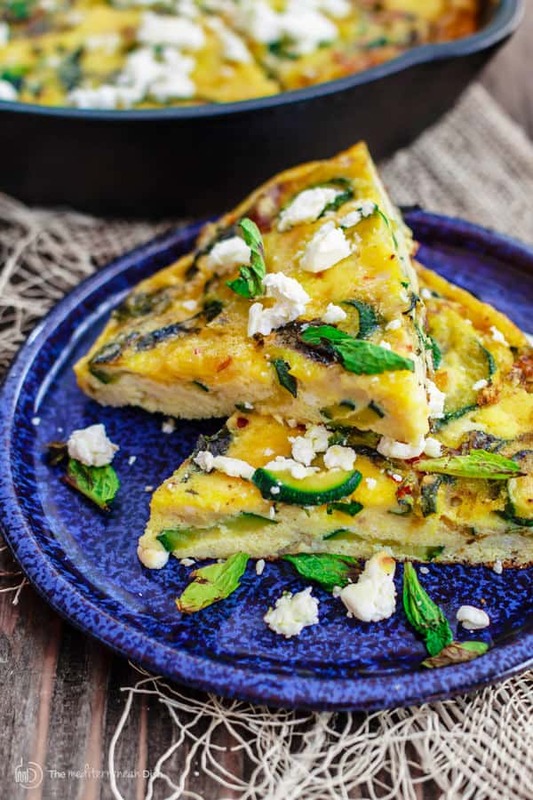 Eggah is typically a dense baked omelet packed with herbs and vegetables. And today, we’re going to start with this simple combination: zucchini, onions, and lots of fresh mint. You can use other vegetables to your liking, of course. 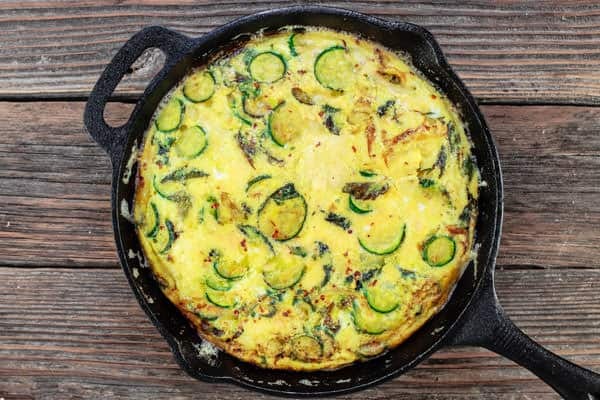 The end result–straight out the oven–is a fluffy baked omelet that soon cools to a denser form of frittata. I like to serve this Middle Eastern baked omelet topped with feta cheese, with a side of lemon wedge and tomatoes. When I have time, I like to add a fresh salad like fattoush or tabouli. If you plan to do that, t’s best to first prepare the salad and leave it in the fridge while you work on the omelet. 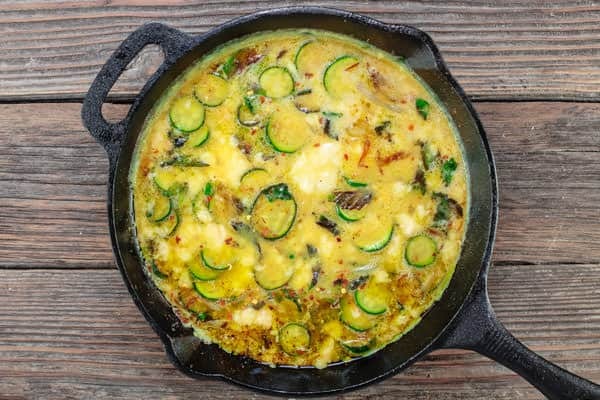 A baked omelet made Middle Eastern style with zucchini, onions and lots of fresh mint leaves. Comes together in 30 mins or less. The perfect breakfast or brunch, especially with a side of fattoush or tabouli salad! Sprinkle the zucchini slices with a little salt and set aside for 15 minutes. Pat the zucchini dry. 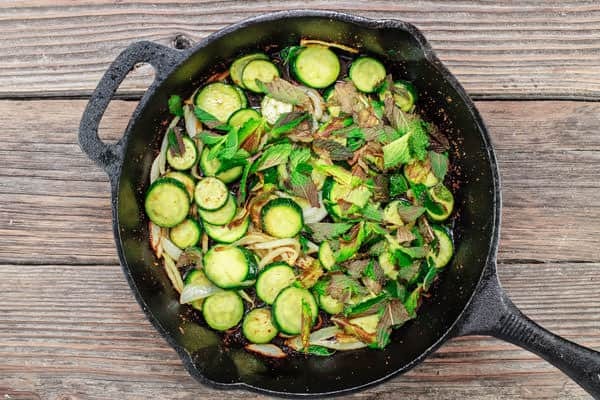 In a 10-inch cast iron skillet (or oven safe skillet), heat the olive oil on medium, then add the zucchini and onions. Raise the heat to medium-high and saute the vegetables for 5-7 minutes or until they are tender and golden in color. Add most of the torn mint leaves; set aside some for later. Turn the heat off and let cool. 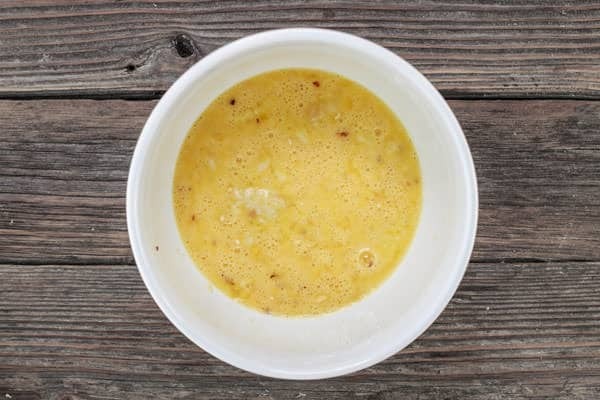 In a medium mixing bowl, whisk the eggs, salt, crushed red pepper, and the baking powder. Squeeze the toast to drain any excess milk, then break it apart with your hands and add the bread pieces to the eggs. Whisk again briefly. Now stir the zucchini and onions in the egg mixture. 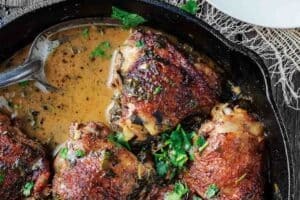 If needed, add a little more olive oil to the cast iron skillet. Transfer the egg mixture to the skillet. Bake in the 350 F degrees heated oven for 15-20 minutes, or until the surface of the omelet looks done. 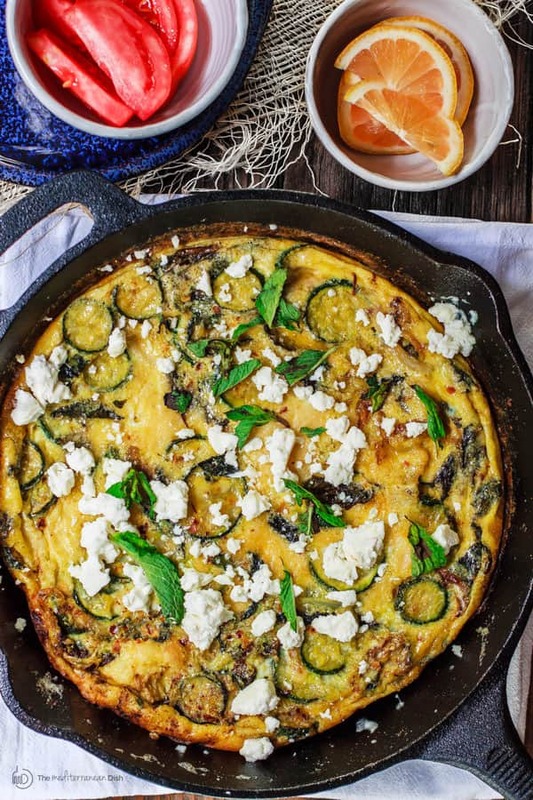 Top the zucchini baked omelet with feta cheese if you like. And garnish with the torn mint leaves you set aside earlier. Serve with lemon wedges on the side and sliced fresh vegetables like tomatoes. A great side dish to this zucchini baked omelet is fattoush salad. Recipe adapted from Mediterranean Cookbook. 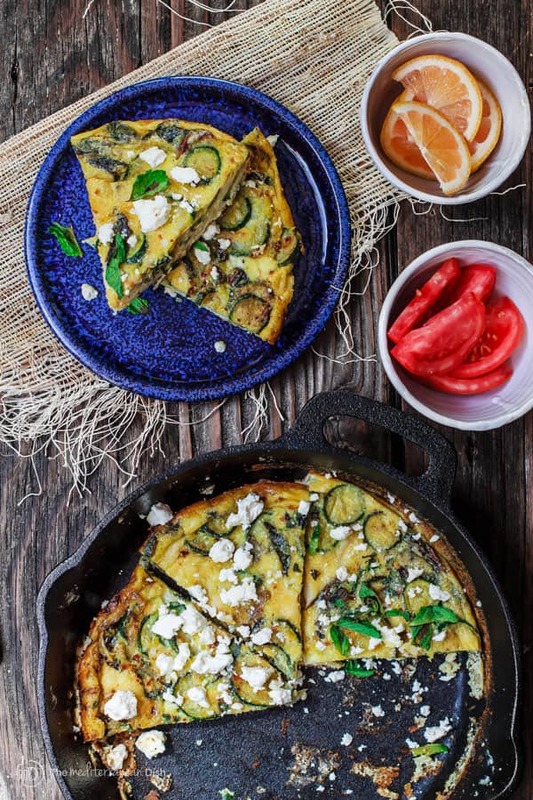 Top the zucchini baked omelet with feta cheese if you like. And garnish with the torn mint leaves you set aside earlier. Serve with lemon wedges on the side and sliced fresh vegetables like tomatoes. *Disclaimer: As an Amazon affiliate, I receive a very small credit when you make an Amazon online purchase within 24 hours of clicking a link here. Please know, I only highlight products that I believe are of good quality and priced competitively, or products that may not be easily available elsewhere. If you are looking for a product not mentioned here today, please consider browsing Amazon via this link. Thank you. Suzy, we are hooked! 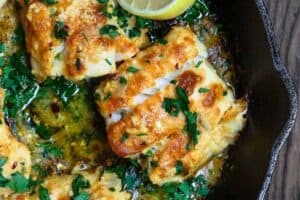 I’ve made about six of your recipes so far, and they have all been absolutely wonderful! My husband commented that I might leave him for you. Have to admit that I was a tad hesitant of so much mint, but I can’t imagine it without it. I served it with a simple green salad. Can’t wait to try more recipes! Forgot to ask… no where in the directions do you mention the garlic powder. I added to the onion and zucchini. I just made this recipe and changed some small thing…like added 3 zucchinis instead of 2, and a little bit of dark olives along the fetta…it was delicious..! Thank you Sussy!!!! So glad you did! Thanks for giving it a try! Made this for dinner with some of our zucchini bounty. It was delicious! I really loved the flavor of the mint in the omelette! We served it with a simple tomato and cucumber salad for a light dinner. Will be keeping this one handy for our summer zucchini! Thanks for a great recipe. Suzy – The baked omelet was amazingly delicious and refreshing. Never knew zucchini could taste so good. I had also made your stuffed zucchini which I also loved. My appreciation of zucchini has increased exponentially because of these two dishes. Thanks Suzy for sharing the recipes. I love the idea of subbing butternut squash this time of year!! This looks amazing! Totally! 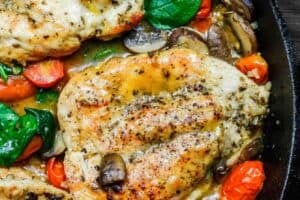 Potato or Butternut Squash in place of zucchini here would work great! Thank you, hon! This omelet looks so good, Suzy! I’m speechless. I bet it tastes as nice as it looks. Thanks for the recipe! Thank you Igor! I appreciate your kind comment. Yes, this one is pretty tasty…we make it often! Yay! Can’t wait to hear what you think!!! I really like the veggies you used. 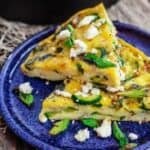 This is a frittata which my favorite way to prepare eggs. 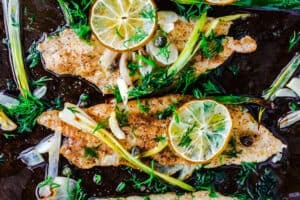 This looks so easy and flavorful, amazing! 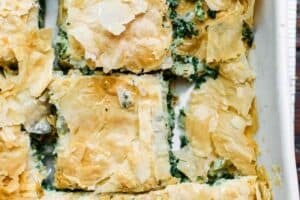 What a gorgeous looking recipe, I have try this for sure!! This was great, Susy! I used very thinly sliced fennel as I had no zucchini on hand. Great to hear it, Barabra! Love that you used fennel!! !